This is the first of four blogs that will describe the ADM 8 Database Project, as it is moving forward and going live. In this entry, I’ll be talking about the documents themselves, showing photos, as well as talking about other documents that I have and am considering including, and others such as ADM 107 that I have decided to set aside for now. Previously, I have written a number of blog posts on this project. Unfortunately, I made a critical mistake. I based my entire planning from looking at a handful of documents (from the beginning of the photos I had), and not looking at the volumes in their entirety. From there, lots of problems. So hopefully, we can consider those earlier blogs about this project a kind of warning. 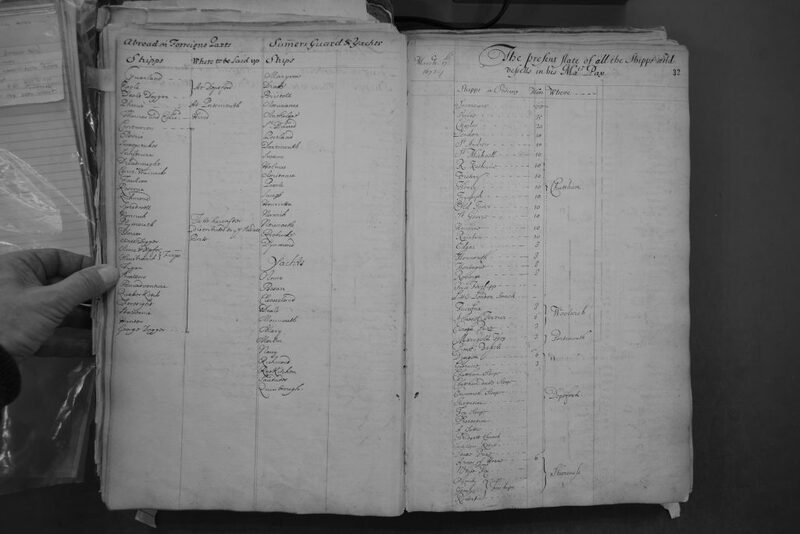 ADM 8 is a series of Admiralty documents, usually summarized as List Books. You can check them out on the National Archives website here. ADM 8/1 starts on 1 July, 1673. ADM 8/2 ends ~1691/2. In these two volumes, there are roughly 360 photos, each covering two pages (eg a left and a right). 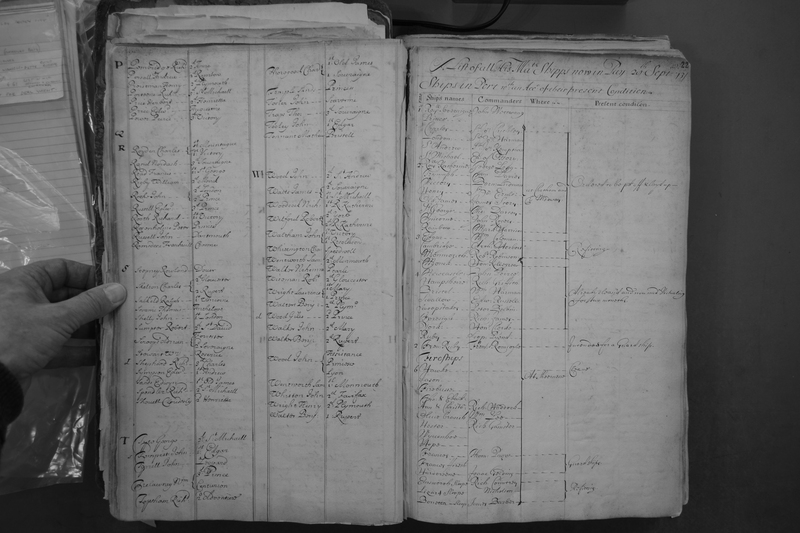 What’s within these documents are lists- and they present a really interesting challenge. With documents like letters or reports- taking photos and putting them online is a really good step because reading them to extract information is fairly straight forward. 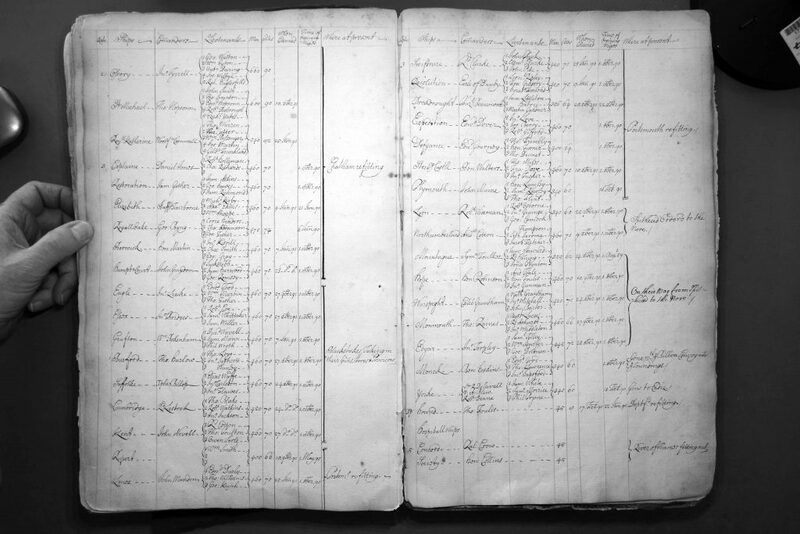 With other documents such as ADM 8, because each report contains so much more data- including ship names, officer names, locations, crew numbers and many other things- transcribing them into a relational database allows for researchers to very quickly ask questions of the entire dataset which would be slow, and painful to do otherwise. In ADM 8 volume 1 & 2, there are six basic types of reports. Just for context, there are approximately 480 pages in ADM 8/1, and roughly 240 pages in ADM 8/2. ADM 8/1 covers from July 1673 to February 1689, and ADM 8/2 from March 1689 to March 1692. 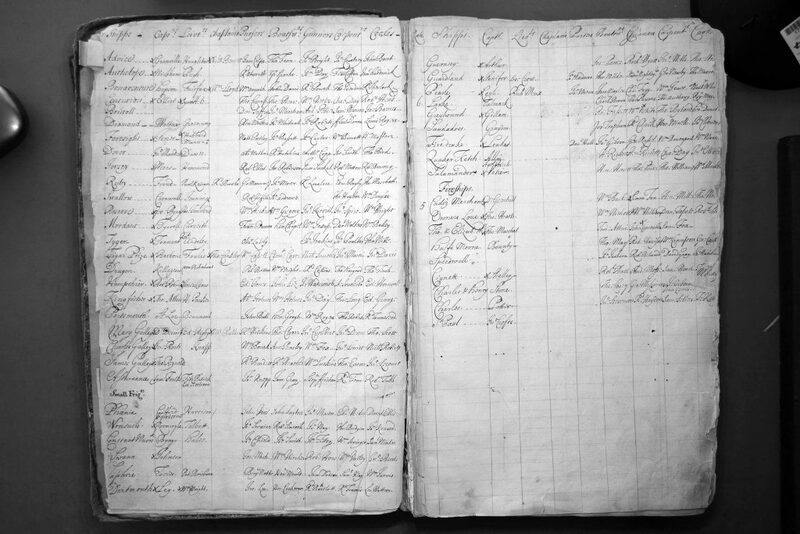 The first type of report details the ships of the fleet that are in pay, where they are stationed, and a number of other details. Let’s look at a few examples. (All photos in this blog can be examined at full size). 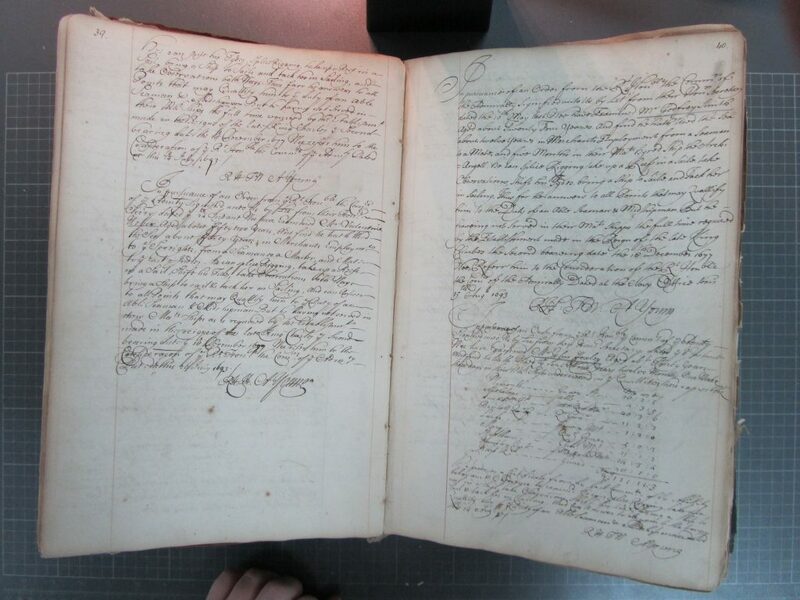 The first image is from the very beginning of ADM 8/1- a report from 1 July 1673. The second image is from near the end of ADM 8/2, from February 1692. In many ways, these documents are quite similar- however there are some changes. The most notable is the listing of the lieutenants. This actually presented a bit of a problem for me in terms of the database design- which I’ll talk about in the next entry of this series. These reports are why I created this project in the first place- as you can see it has a lovely mixed set of data. Currently, I have two reports of this type transcribed and in the database (as of 11 November 2017), from 1 and 21 July 1673. The second type of report in these volumes are lists of officers. 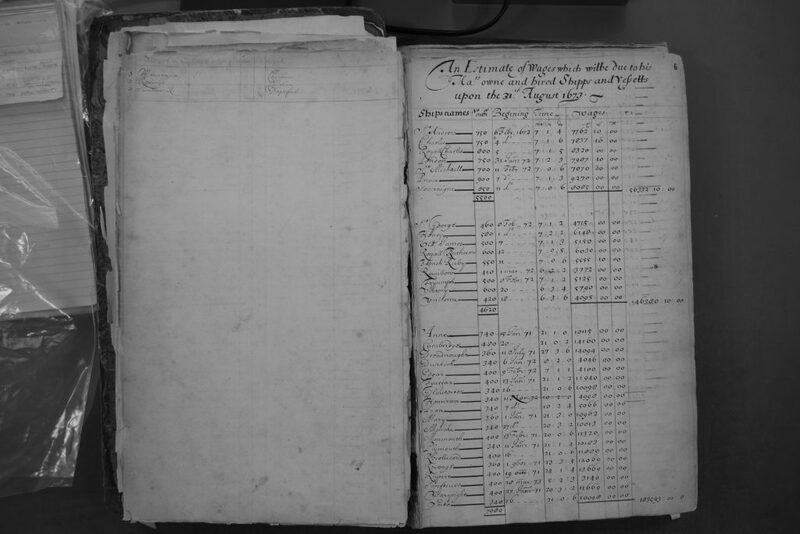 There are in comparison, far fewer of these types of reports, and mostly occur earlier in volume 1 (the 3rd Anglo-Dutch War) rather than in volume 2. ADM 8/1 f20 verso & 21 recto Photo Credit: JD Davies. ADM 8/2 np Photo Credit: JD Davies. The two examples I’ve chosen are from September 1673 and march 1692. As you can tell, they are very different, and include very different columns. The way that these columns change certainly does complicate both transcription, uploading, storage and presentation. As you can also tell, these are really two very different types of reports, in that the first example is in some ways a reflection of the officers who have previously (although recently) served, while the latter is very much supposed to be a current representation of the commanders of the fleet. 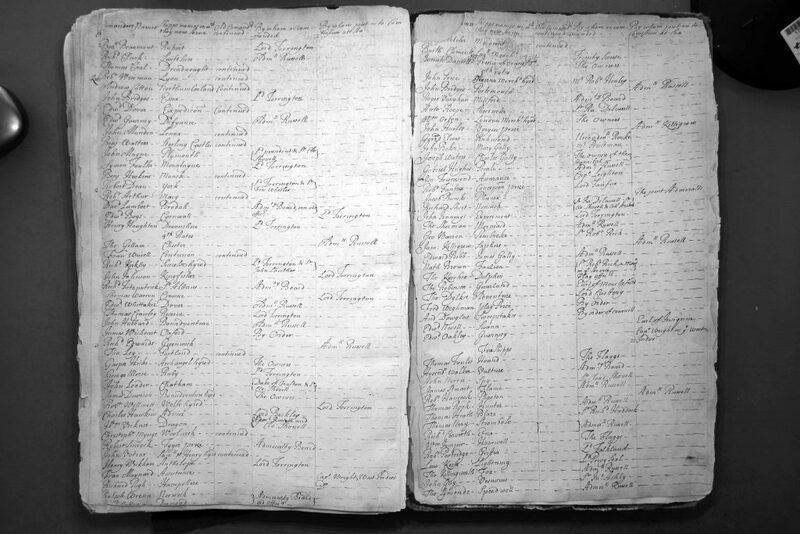 Lists included in ADM 8 also include commanders of Fireships, and Lieutenants. 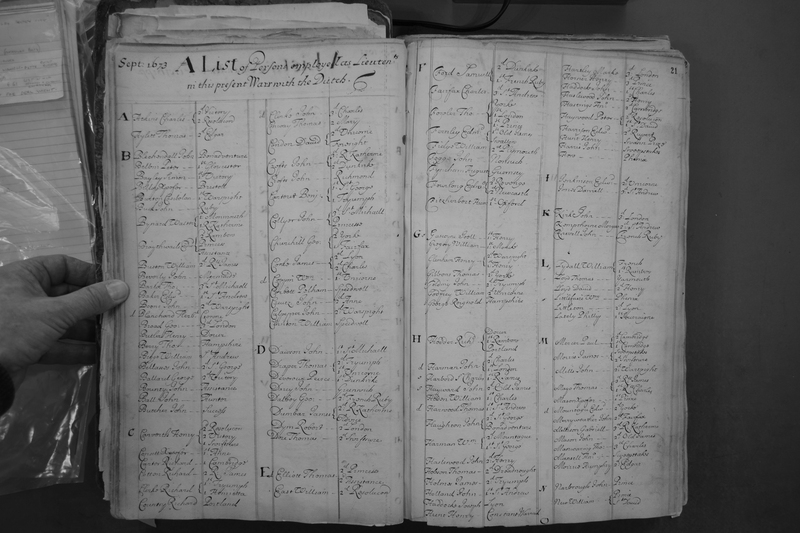 David Davies has also provided me with images of ADM 10/10 and 10/15, which are also officer lists. I am still considering whether to include these into the project, however they have a lower priority than expanding to ADM volumes 3 and beyond. 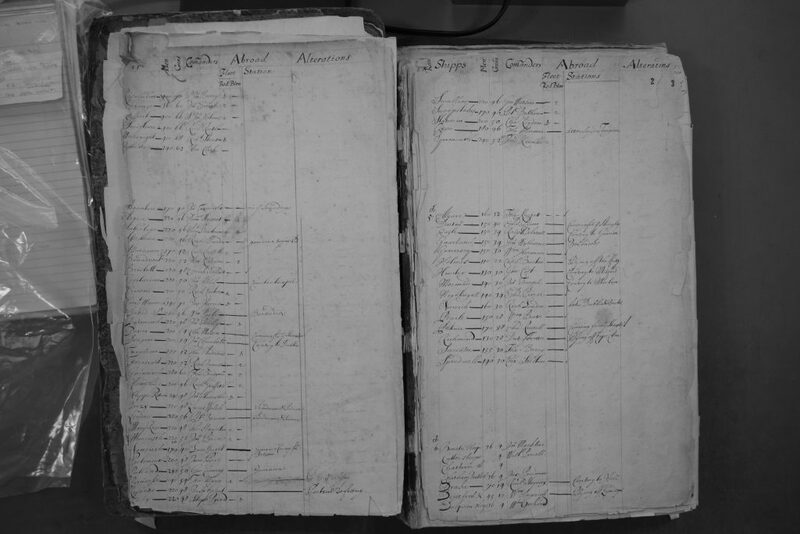 here we have images of two very different reports, both from ADM 8/1. 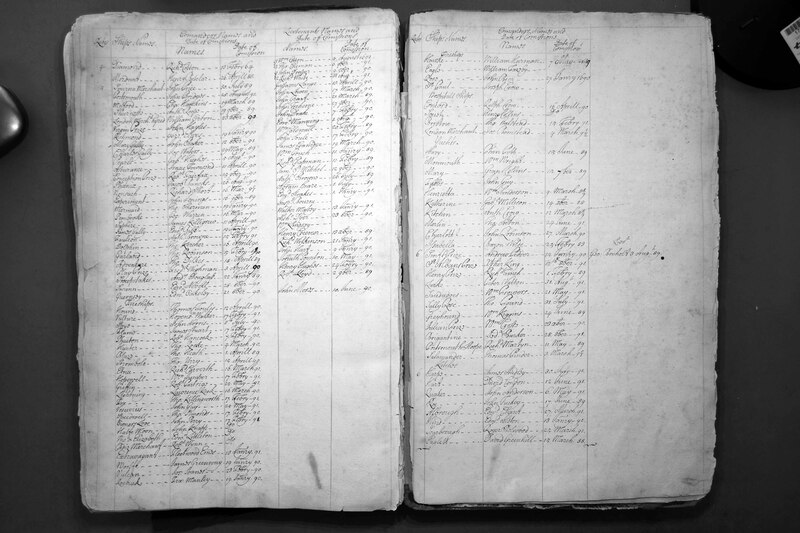 The first is a straightforward list of ships and the wages owed (and is one of the first reports to be transcribed/included in the database when this project goes live). The second example (of which I’ve included two photos) is more complex. 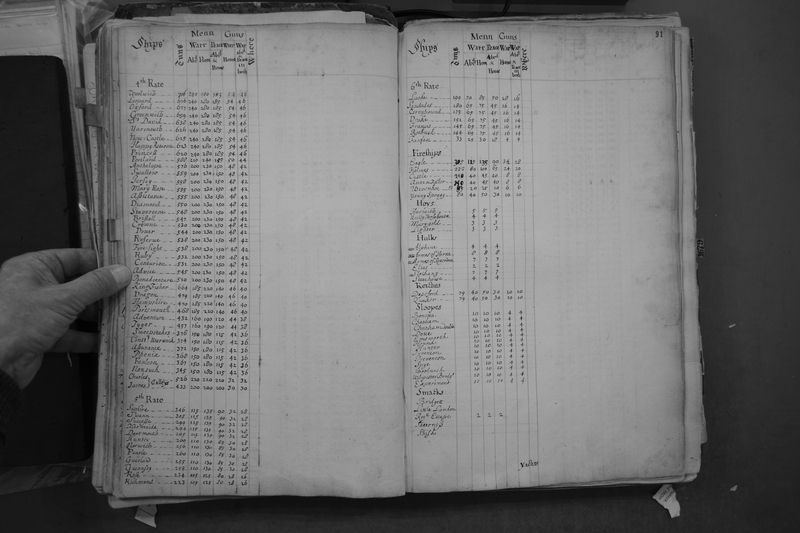 The first page is what looks like a fleet status report or disposition list, while the remainder of the pages contain wage data. In this case, I’ve included this as the latter type. The fourth type of report are fleet status reports. These are often shorter reports, providing specific details for small groups of ships. Here these two examples are on the right page from ADM 8/1, and on the left from ADM 8/2. These show the differences and diversity of these kinds of reports. They are very much updates of what ships are doing at exactly that moment. For example, in the second example it is a report about what ships will be ready when, with some references to specific letters in which that information can be found. The fifth type of report are fleet lists, which describe the dimensions and other data for each ship. These reports begin from 1677, and occur sporadically throughout ADM 8/1, but do not appear in ADM 8/2. ADM 8/1 f90 verso & f91 recto. Photo Credit: JD Davies. These two reports are ten years apart, and they show quite a bit of similarity between them. 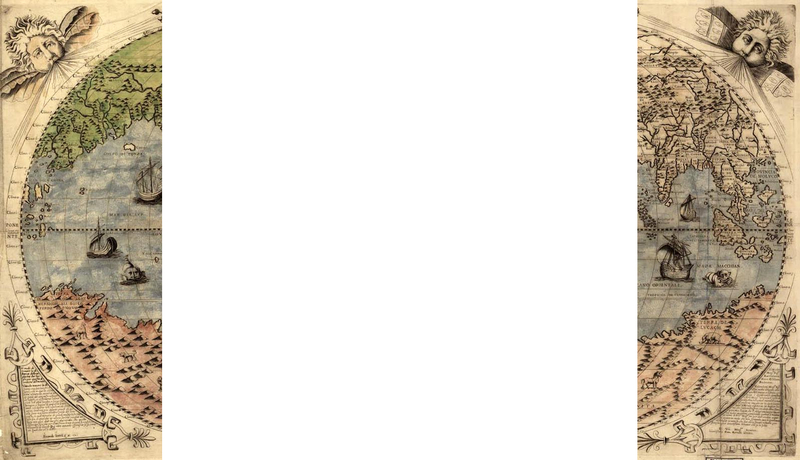 In fact, there are ten reports of this type, all in ADM 8/1. the sixth type of reports that describe additions and removals from the fleet. These are quite common in ADM 8/1, and do not appear in ADM 8/2 at all. Theses are very interesting document since they show which ships were added and removed from the fleet in a specific period of time. There are also several other, unique reports. These are definitely spanners in the works. ADM 8/2 np. Photo Credit: JD Davies. This is one of the first documents in ADM 8/2. It is fascinating and unique because it’s the only report in the first two volumes that provides so much detail for ships’ officers, such as Chaplains, Pursers, Boatswains etc. 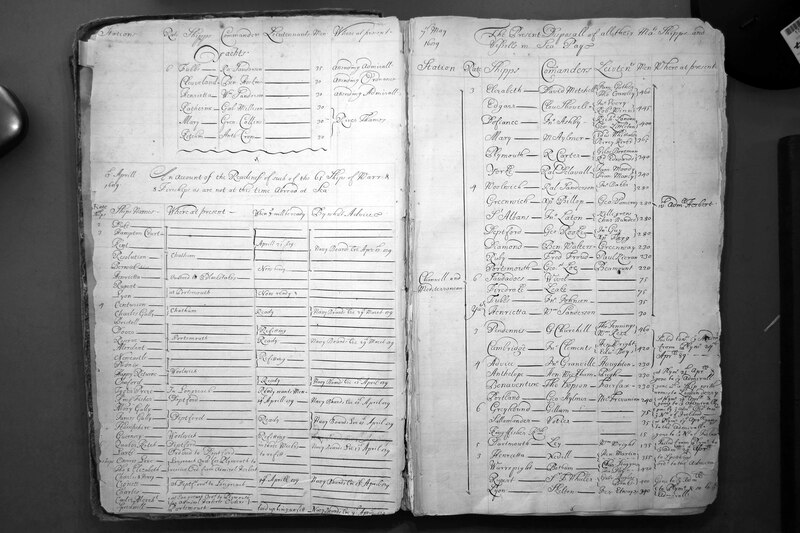 In this example, also from the second volume, are a list of officers and their commission dates. Likewise, a couple of pages later, there’s a list of ship commanders plus on whose recommendation they were selected as a commander, and who actually commissioned them. For some of these reports, it’ll be necessary to create their own upload script. For others, they can be accommodated within the other report types. So as you can see, these documents are quite complicated- no less because so many of the different types of reports actually share some fields. I’ll talk at length about why I chose to create a perhaps larger than strictly necessary number of types of reports in the next entry. As those who have been following this saga from the beginning may know, I also have photos of the first three volumes of ADM 107, which are Lieutenant’s Exam reports. I had decided a few months ago to set those photos aside, for various reasons including that they involve much larger blocks of text than the ADM 8 documents. Let’s have a look. These reports do have far more text than the ADM 8 documents- at least larger chunks of text- what I believe is effectively boilerplate language, mostly. Indeed, one of the great things of putting these documents into a database would be to do a through analysis of the language used. The first three volumes cover the early 1690s to the 1740s, so provide quite a bit of data. I am quite confident that the MySQL database would be able to handle this kind of data quite easily, and it would be very interesting to link reports from ADM 8 to Lieutenant’s exams from ADM 107, through individuals, ships and perhaps even locations. That said, including these in the project is currently a lower priority than acquiring ADM 8 volumes 3 and 4. In the next entry of this series, I’ll talk about the process of database design, and detail the various tables and their structures. This is going to be a AMAZING resource!! 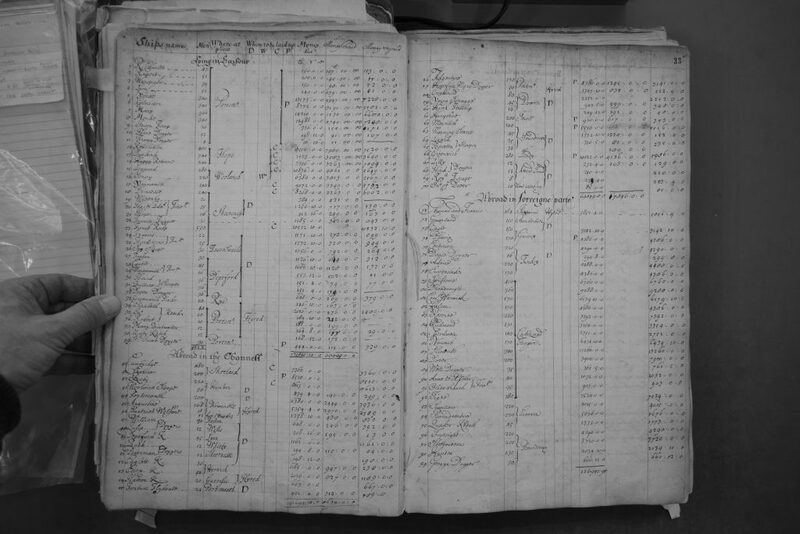 For scholars and also people doing a variety of research such as family histories. Thank you! I hope so. 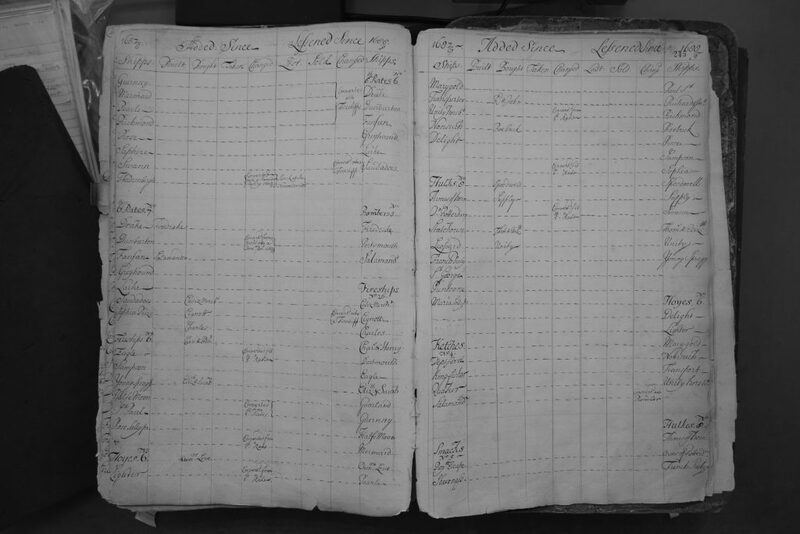 At the moment I only have a handful of reports transcribed- so I am looking for volunteers at this point.